A powerful photo has emerged of a young Girl Scout fearlessly standing up to a neo-Nazi in an overwhelming act of bravery. Standing your ground when faced with a fully grown adult right-winger, when you’re a young girl aged just 16 is no easy task, but this Girl Scout absolutely smashed it. Lucie Myslíková was pictured in a face-off with a neo-Nazi protester at the recent May Day rally in Brno, Czech Republic in a ‘perfect act of defiance’ the Mirror reports. The teenager is kitted out in full girl scout gear, with armed police looming in the background as she stares out her frantic opponent with a calm look of indifference on her face. The moving photo has now gone viral after it was shared by the World Organisation of the Scout Movement on Facebook, earning itself thousand of likes and shares in support for the girl. Lucie decided to join her fellow Scouts and Guides at the rally when she ended up straight in front of an irate neo-Nazi. She was standing tall and she’s 16 years old and she stood proud and made some profound arguments. We wanted to show the neo-Nazis that they are not welcome here. This year the counter-protest was to make fun of and to troll the Nazis. Thankfully, according to local media reports, the 150 neo-Nazis gathered at the rally were outnumbered by their left-wing opponents by two to one. The WOSM shared an uplifting message celebrating Lucie’s ‘courage’ and achievement, as well as their success in overpowering the neo-Nazis at the rally. People from all walks of life, and scouts among them, came to the streets during an extreme right march yesterday to express their support for values of diversity, peace and understanding. Creating a better world! Executive Assistant at the World Scout Bureau, European Regional Office, Rupert Schildbock said most people had gone out in the country’s second largest city to ‘enjoy a peaceful,’ time. The photo was mainly met with an overwhelmingly positive response, although disturbingly some people slammed the Scouts and said they shouldn’t get involved in politics and the snap was ‘manipulated’ as part of a wider agenda. 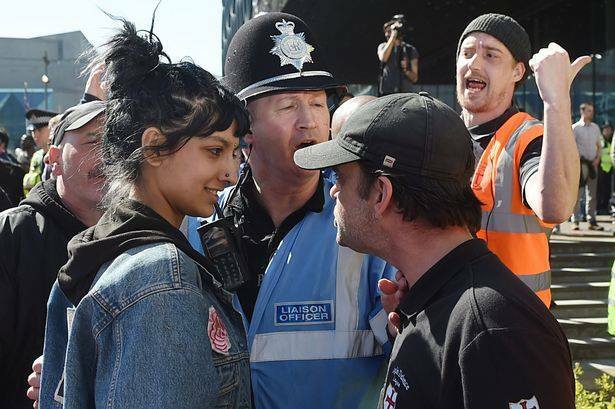 The touching photo comes after a similar scene in Birmingham, UK when a Muslim girl stood upto an enraged man from the far-right English Defence League. It just goes to show it doesn’t matter how young you are, anyone can and should stand up for what they believe. Staring down your enemy would be pretty tough for anyone though, all credit to her, what an absolute hero.